Chili has always been one of my favorite winter dishes. I remember my mom making it for lunch on cold, snowy days. You could smell the delicious smell wafting throughout the house, making us hardly able to wait to eat it. And it was so good…so filling and warming. We don’t get a lot of snow here where I live now. But that doesn’t stop me from making some chili. I take the opportunity on any cold or rainy day to make a batch. Is there anything better than a warm pot of chili simmering on the stove on a chilly day? -An assortment of dried beans. 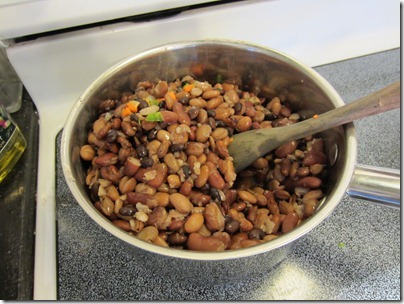 I use pinto, black, and red kidney beans. -Ground beef, sausage, or turkey if you like. Meat really isn’t necessary though, so you can skip it a save a few dollars! My meat;loving husband has never noticed when I omitted the meat. -Cans of tomatoes. You can use whatever kind you want, but I usually use tomato sauce and Rotel. -Seasonings. I’ll get to that later. You can use whatever you have on hand! -Extras. Anything you want! Bell peppers, carrots, hot peppers, lentils…the possibilities are endless! 1. First, you want pick out your beans. 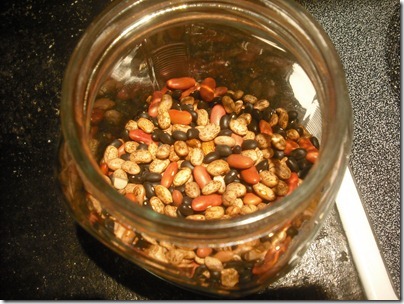 Dried beans expand as they soak and cook, so you won’t need as many as you think. One cup is seriously more than enough for my husband and I to have seconds plus tons of leftovers. I usually don’t even measure! 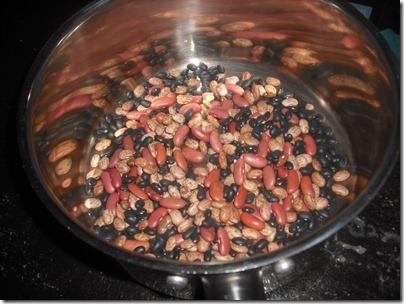 You can use any mix of beans you like or have on hand, but I usually use about 3 parts pinto beans to 1 part black beans and 1 park red kidney beans. I have a little jar I store my little chili mix and and take out the beans as needed. Experiment and see what kind of beans you like best! 2. Next, you need to soak your beans. This is essential to the dried beans cooking and not being crunchy! The best way is too soak them in water overnight, but I usually forget so you can also “quick soak” them by putting your beans in a pot, covering them with water, and bringing them to a quick boil. Once they boil, turn off the heat, cover them, and let them soak for an hour. Now you’re ready for step three! 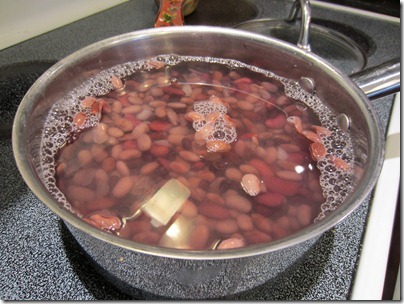 *Note: Be sure to add something acidic (vinegar, lemon juice, whey) to the water you soak your beans in. This will help break down the beans and will actually reduce the dreaded side-effect of chili later (ahem, gas). 3. 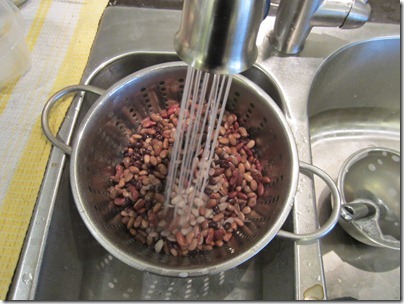 Once your beans have soaked, drain them and rinse them thoroughly (again, this reduces indigestion). 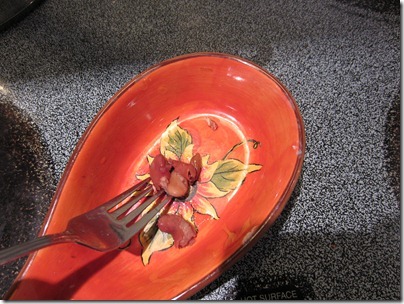 Then put them back in your pot, cover them with as much water as you can fit in the pan, and bring them to a boil. Let them boil for 1-2 hours or until they’re tender. You can check this by skewering a few with a fork and trying them. Nobody wants crunchy beans in their chili! 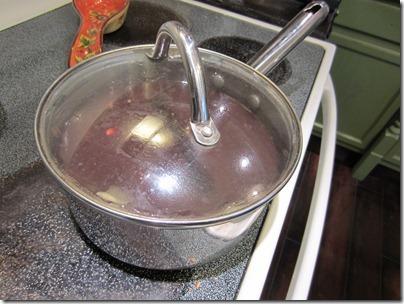 Once your beans are cooked, drain them again. *Note, if you want to add lentils (or another grain) to your chili and save time, add them in with the beans for the last little while they cook. 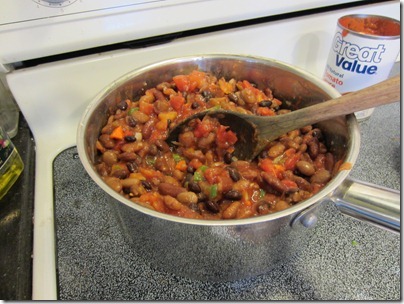 They’ll already be cooked and mixed in with the beans for later! 4. Now it’s time for the fun part. 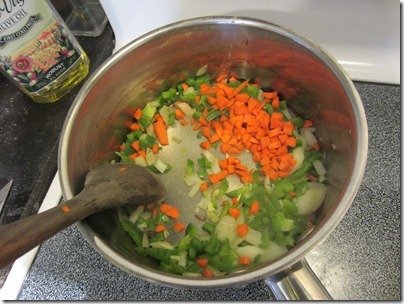 Heat about a tablespoon of oil or butter in a big pot on medium-high. Chop up your onions and mince your garlic and add them to the pot. You want them to be nice and tender! Also, add in your ground meat (if you want it) and brown it. This is also the time to add any extra vegetables you want to sneak in. I usually chop up red or green bell peppers, and even carrots. If you have any hot peppers on hand, now would be the time to chop those up and add them as well. Adding fresh hot peppers really makes a chili delicioso! 5. 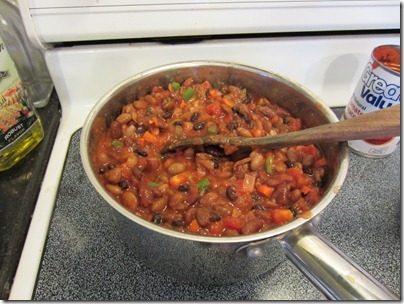 Once all your veggies are tender and your meat is cooked, add the drained beans into the pot. Then add a couple of cans of tomatoes. I always add at least one can of Rotel and one can or tomato sauce. Add more as needed. Some people like their chili thicker or more watery than others, so it’s entirely up to your tastes. Turn the heat down to low so that the chili will just simmer. 6. Now it’s time to add your own “flavor” to the dish. I never use the pre-mixed seasonings they buy at the store. Not only can you not control what’s in them, but it’s also a tad bit cheaper to make my own. Plus, it’s fun! I don’t premix anything…just throw in what looks good. 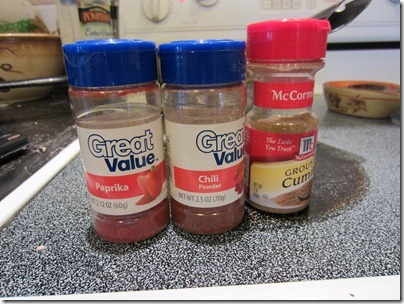 Usually, I use about a tablespoon of chili powder, a teaspoon each of paprika and cumin, and about 1/8 of a teaspoon of cayenne pepper. Then I just add what looks good! I usually add in salt and pepper, oregano, and cinnamon. Really, though, you could add whatever you want. Just don’t overdo it! Add a little at a time, taste it, and see. Remember, you can’t go back! For a little extra you could even add in some honey or chocolate. This gives the chili a little sweetness and richness. Make the chili your own! 7. Now, let the chili simmer so all the flavors can meld together. Usually 20-30 min. is good enough, but you can let it go as long as a few hours. Just be sure to check it every once in awhile so that nothing burns! 8. Enjoy! Chili is great with corn bread. My husband also likes to add fritos, cheese, and sour cream. Remember, making chili is all about individuality, so experiment and do what you and your family like. Have fun with it! Trust me…you cannot mess up chili…it’s impossible! What’s your favorite chili recipe to make? Yum! This reminds me a lot of my mom's chili 🙂 I just “pin”ed this though… can't WAIT to try it! 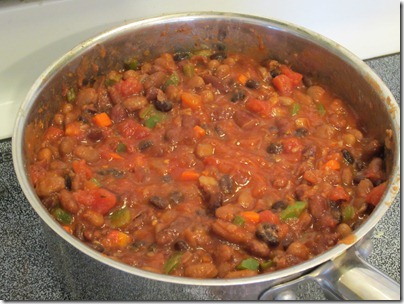 This is definitely inspired from my own mom's chili too…although she uses canned beans. I think I'm just a cheapskate compared to her!